Unless you’ve been hiding under a rock (or just don’t care about it), you’ve probably heard about many developers complaining about Apple’s developer site recently. Recently Apple released information on why they caused many developers grief. In an email to developers recently, Apple written that an intruder attempted to grab some sensitive personal information of registered developers though the developer website. After noticing the potential breach, the company immediately took the website down and has been working on it full time since the intrusion. Even though Apple encrypts sensitive personal information, they cannot rule out if some of the developers’ names, mailing addresses, and/or email addresses may have been accessed. Since the developer site was down, some amount of developers said they received unsolicited password resets. Currently, Apple is completely overhauling the entire developer system. This means that the company is not updating its servers; it is rebuilding the entire database. To help cover the downtime, Apple has also said that they will be extending membership periods and not pull any apps if the developer account is up for renewal during the downtime. Even though the security breach was to the Apple’s developer accounts, standard iTunes/Apple accounts and app codes were not affected in this attack. The only effect to consumers is a stop in the flow of new and updated app, as the site is used to handle all of the developer needs (including programming, forums, and the distribution of apps). Currently, developers have been spending a countless hours getting their apps ready for the official release of the next operating system that is expected to come sometime in fall. 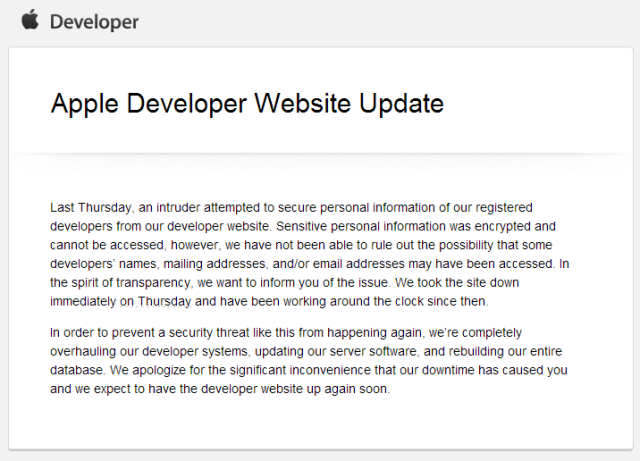 Apple expects that the developer website to return soon.